This article is expanded from a letter sent to the National Post on Sep 30, 2000 (see bottom of this page). When I was 12 years old, I met Pierre Trudeau. I think it was 1979 and my junior highschool was visiting Ottawa for all the typical reasons that school kids visit their nation’s capital: to stroll through dreary museums, read the captions of historic paintings and sculptures, and to suffer the lectures of local scholar/entertainers dressed as town criers and Indian chiefs. But I and two friends, assisted by a particular far-thinking teacher, escaped from our 8:pm curfew one evening to commit the ultimate uncool act. We gave up sleep and the juvenile joys of our parent-less hotel room to attend a rare night session of Parliament. That evening, our federal representatives were to decide upon the issue of capital punishment. While our friends were no doubt looking for ways to watch cable TV and to steal hotel towels, we were to observe history in the making! Of course, as I recall it, the MPs voted not to decide, and the evening was over rather prematurely and anticlimactically. But as we youngsters idled in the lobby, putting off our return to hotel imprisonment, the Prime Minister himself emerged from the House, radiating a magnificent presence that I can now only describe as Jesuitical in its meditative genius. Mr. Trudeau waved the media aside and walked straight up to us three pipsqueaks, bending low his seemingly lofty 5’5″ frame to shake our little hands. I did not know that he was considered a short man, or, for that matter, that his marriage was dissolving at that time, or that he was about to lose an election for the first time ever. All I knew was that this man was a hero to me and my family, a figure that demanded respect and deference. His image is thus etched into our memories, framed about obsidian eyes that shone with a lively and genuine joy. He muttered to me a very friendly greeting and something about the political process. But our attention was absorbed by the intoxicating ephemera of his celebrity, and then snatched by another source of unexpected joy for 12-year old boys: Trudeau’s female chauffeur. After his departure, followed closely by the obligatory crowd of journalists and unnamed pursuers, political mainstay David Crombie (at that time a sitting Conservative MP) approached us to help explain the Parliamentary event we had earlier witnessed. But, rudely, our juvenile eyes remained fixed on the receding limousine, each of us fully aware that we had brushed close to a great historical figure, our lives perhaps changed for the better. Those were exciting days for a young citizen to be first exposed to the Canadian political process, capped by the graceful greeting of my generations brightest national figure. 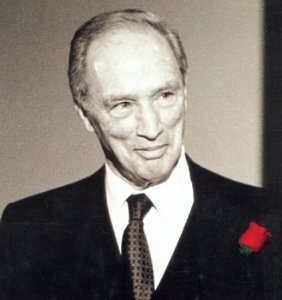 I’m often saddened that the youth of today are unable to access that brand of optimistic statesmanship, that the casual profundity of a Pierre Trudeau will be forever denied our children. I wept when I learned of his death, and absorbed every media report of our nation’s communal grief, feeling a very honest and profound loss for the secondary father figure that had been taken from us. Its a difficult thing to explain to some of my friends who, for whatever reason, see Mr. Trudeau as just another dead politician. Some of those friends are not from this country, so cannot understand his prominence in our lives. Some are too young to recall the air of excitement that Canadian government was able to generate in those days. Others are simply politically unaware. And others lack the very particular perspective of a whole generation of fresh immigrants. Canada in the early-to-mid 1970s was a place hostile to anything that was not white, English or otherwise mainstream. As new immigrants, many of us endured the vocal and sometimes physical disdain of others on an almost daily basis. I can only imagine that many Canada-born francophones felt the same hostility or foreignness when they ventured beyond their safe environs. To have had the leader of the country, the most powerful voice in our society, declare his unwavering support for our rights and for our access to opportunities was a contribution as valuable as any budget or constitution. He validated us, allowed us to share his dignity. To us, he was a hero…. …And, dare I say it, a national father. It has been said by others that Trudeau is the progenitor of modern Canada. Our multicultural, free-thinking, somewhat just and fair society sprang directly from his vision. These things sound commonplace and obvious now. But they were revolutionary when first introduced. Much like losing a true parent, one is struck by the hollow horror of having to continue on without the deceased’s wisdom, his standard. Only now do we appreciate how much of him we took for granted. I once wrote that my generation has thus far lacked the newsworthy milestones that serve to link a people to the grand trunk of humanity. I was very wrong. There have been many such instances, I realize now. And, regrettably, the death of this great man is yet one more. It has been my very great honour to have met some truly gargantuan figures in human history. Among them, Nelson Mandela, the current Dalai Lama and a slew of Canadian political leaders. Of them all, it is Pierre Trudeau, whose hand I shook 21 years ago as a delinquent schoolboy, who most decidedly imprinted himself onto my life. I don’t weep for him any more, but for the rest of us who must continue without his clarity and profundity. It was 1979 and my junior high school was visiting Ottawa for all the typical reasons school kids visit their nation’s capital: to stroll through museums, read the captions of historic paintings and sculptures and to suffer the lectures of local scholar/entertainers dressed as town criers and Indian chiefs. But I and two friends escaped from our curfew one night to attend a rare night session of Parliament. As we idled in front of the building, putting off our return to the hotel, the prime minister himself emerged from the House, emanating a magnificent presence. Mr. Trudeau waved the media aside and walked straight up to us, bending low to shake our little hands. His image is thus etched into my memory, framed about obsidian eyes that radiated a lively and genuine joy. He gave us a few friendly greetings, but our attention was completely absorbed by his intoxicating presence.